Dr. Shah is an Associate Professor at Harvard Medical School. He is also a Principal Faculty at Harvard Stem Cell Institute in Boston. 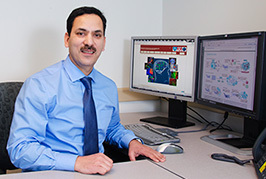 In recent years, Dr. Shah and his team have pioneered major developments in the stem cell therapy field, successfully developing experimental models to understand basic cancer biology and therapeutic stem cells for cancer, particularly brain tumors. These studies have been published in a number of very high impact journals like Nature Neuroscience, PNAS, Nature Reviews Cancer, JNCI, Stem Cells and Lancet Oncology, validating the use of therapeutic stem cells alone and in combination with clinically approved drugs for cancer therapy. Dr. Shah’s work has also caught the attention in the public domain and as such it has been highlighted in the media world-wide including features on BBC and CNN. The potential for developing clinically relevant tumor models and novel stem cell based therapies and imaging markers for cancer in his laboratory has been recognized by many cancer alliances and associations. Based on this, he has received the Young Investigator award from Alliance for Cancer Gene Therapy (ACGT), Research Fellow award from American Cancer Society (ACS), a number of translational grant awards from American Brain Tumor Association (ABTA) and innovator awards from Goldhirsh Foundation and James S. McDonnell Foundation and Department of Defense (DoD). Additionally, Dr. Shah has participated in the training of numerous undergraduate, graduate students and residents at MGH and the potential of his mentoring has been recognized by Harvard Medical School and awarded him the Harvard Young Mentor Award. Dr. Shah holds current positions on numerous councils, advisory and editorial boards in the fields of stem cell therapy and oncology. The technologies from Dr. Shah’s laboratory have led to the foundation of a biotech company, AMASA Technologies Inc. whose main objective is the clinical translation of therapeutic stem cells in cancer patients.